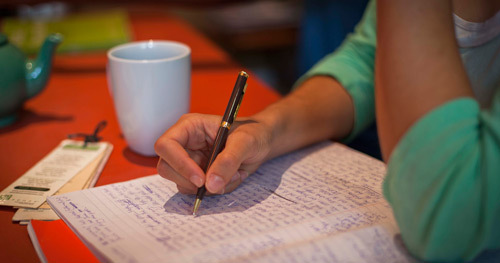 In Level III, writers bring together the skills acquired in Levels I and II. The focus is on deepening the emotional connection in your writing and further developing your own voice and material. Fiction writers work on building and sustaining readers’ interest over longer pieces. Weekly reading assignments and in class discussions provide inspiration and help you continue to hone your technique. Each week you’ll have the option to create your own exercise based on that week’s reading or to continue to develop a previous exercise. Students who have completed one term of Level III can schedule one night per term to bring in up to two poems or 3000 words (roughly 8 pages) of work outside of the regular syllabus for critique. Level III workshops run for 8 weeks and meet once a week from 18:30 – 21:00 at Boekhandel van Rossum or Sarphatistraat 213 (see the specific course description for details). Class size is usually 8-10 people. This course is open to writers who have completed at least two terms of Level II and by permission of the instructor. If you’re not sure if you qualify, get in touch. Most writers take two to four terms of Level III before moving to the Master Class.